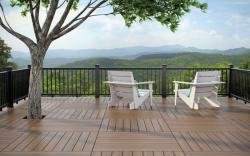 Deckorators® Vault is a giant leap forward in wood-alternative decking. Made with patented Eovations™ technology, it has the industry's best strength-to-weight ratio. It's powerful, stable and doesn't absorb moisture. Deckorators® Vault is a giant leap forward in wood-alternative decking. Made with patented Eovations™ technology, it has the industry's best strength-to-weight ratio. It's powerful, stable and doesn't absorb moisture. Plus, the durable polymer cap stock won't stain or fade. The Eovations technology inside Deckorators Vault allows the decking to be lightweight, but creates a fiber-like structure inside, similar to wood, giving it unmatched strength. The lightweight boards are easy-to-handle on the job site and have similar properties to PVC; however, unlike PVC and other composites, Vault won't splinter, sag, chalk or crack. Overall, deck installation and maintenance are improved with our brand new premium deck boards. Slotted-edge decking gives an undisturbed, fastener-free appearance to the surface of your Deckorators board. The Stowaway fastener system correctly spaces your decking during installation to speed up the process. The solid-edge board is perfect for use when board edges are visible, such as a picture-frame boards or stair treads. Solid boards should be face-mounted with composite wood deck screws. Deckorators products are backed by an industry-leading warranty. Our new 25-year removal and replacement warranty is the first of its kind. We have you covered. Looking for prices on Deckorators Vault Composite Decking Materials? We can help! Fill out the form below and we will calculate how much you need, then give you a price. If we have additional questions, we will email or call you.